If you take a multivitamin and mineral supplement regularly you're likely to live ten years longer. At least, you'd think so if you read a study from the University of Utah, published in the American Journal of Clinical Nutrition. The researchers discovered that women who took a supplement containing extra micronutrients every day had longer telomeres. Telomeres are located at the end of your chromosomes, the biggest building blocks of your DNA. See the picture here. The X form is a chromosome pair; the blue ends are the telomeres. 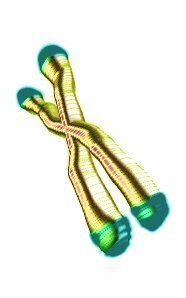 As long as you have telomeres at the ends of your chromosomes your cells can continue to divide. Each time cell division takes place the telomeres get smaller. They get used up. The longer your telomeres, the longer your biological life expectancy, so the theory goes. The researchers measured the length of the telomeres in the white blood cells of nearly 600 women aged between 35 and 75. From a questionnaire that the women completed the researchers worked out which women took nutritional supplements and the amount of micronutrients they got from their food. The women were part of the American Sister Study, a project set up to identify the factors that reduce the chance of breast cancer. On average the women who took multivitamin supplements had five percent longer telomeres than women who took no supplements. That means that their biological age was ten years younger. The figure below shows the effect of taking vitamin supplements in general and the effect of taking vitamin supplements that are sold as complete multivitamin supplements. Supplements that only contain B-vitamins, usually sold as stress reducers, have no effect on telomere length. Multivitamin preparations containing antioxidants on the other hand were better than other types of multivitamins. The telomeres of the women who took antioxidant multivitamins were eight percent longer than normal. Some women took supplements that only contained a few micronutrients. These had no effect. Pills containing only iron actually shorten the telomeres. Supplements with extra B12 were an exception. These do lengthen the telomeres. Recent long-running human studies have shown that antioxidant vitamins have slightly negative effects. High doses of vitamin A and E, for example, undermine the positive effects of physical exercise on insulin sensitivity, according to an article by German nutritionists in PNAS. Supplements containing selenium increase the chance of developing diabetes. [Ann Intern Med. 2007 Aug 21;147(4):217-23.] Supplements containing folic acid increase the risk for prostate [J Natl Cancer Inst. 2009 Mar 18;101(6):432-5.] and digestive tract cancer. [Nutrition Reviews, Volume 65, Number 11, November 2007, pp. 504-511.] But most of the studies have been done on people who have taken a supplement containing high levels of one or two micronutrients for a long period of time. Multivitamins provide a complete range of minerals and vitamins in smaller quantities. Am J Clin Nutr. 2009 Jun;89(6):1857-63.